We are nearing the end of our series on guns, in which we use critical reasoning skills and actual data to formulate plans with real efficacy, without participating in all this culture war garbage. There are too many “gun deaths,” and we should do something as a country about those gun deaths. 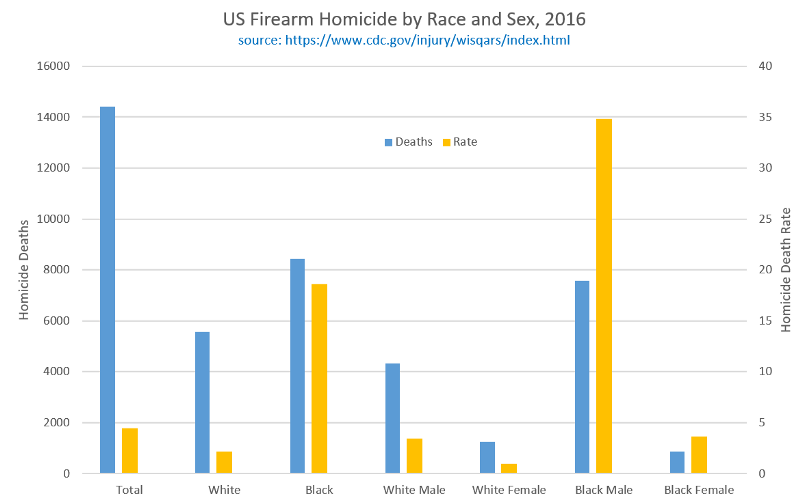 · The entire idea of a “gun homicide epidemic” is a media fabrication that flies in the face of fact. Homicides are quite low compared to any reasonable historical baseline here, and comparisons to homicide rates of other countries are meaningless and counterproductive. · Gun homicide does not track in any significant way with gun ownership rate or guns per capita. · Gun suicide, however, does, and constitutes two thirds of the total gun deaths, which one of the most important features of our Resolution above. · Mass shootings and school shootings are a media red herring that have no measurable impact on the problem. · The media cannot be trusted to steer the conversation in a rational and reasonable way, because they are not interested in solutions, they’re interested in viral traffic, and culture wars get them the most clicks. All of these things are true things, and if we need a refresher about how or why they are true, we can follow the links back. The point about viral traffic is actually more frightening to me than anything going on with guns right now, and will be the focus of at least one, if not many, future articles. Because our plan is data driven and based on critical reasoning, it must address the nature of the problem that we have identified within the numbers. Magazine size restrictions have no efficacy. Our primary problem is suicide, and you only need one bullet to kill yourself. Swapping mags takes very little time. The fire rates of mass shooters are not significantly impacted by mag size, and even if they were, mass shooters barely register as an actual problem within the “gun deaths” numbers. Mags are cheap, easy to manufacture, can be easily 3d printed, and do not expire. Making certain mags illegal turns a huge number of law abiding citizens into criminals. The current 10 cartridge magazine size limitation contemplated by the left is lower than most ordinary pistols sold for home defense or used as police sidearms. Banning “assault rifles,” defined herein as semiautomatic rifles with detachable box magazines, also has no efficacy. An assault rifle ban does nothing to prevent suicide, which again is our primary problem. Only 0.7% of gun deaths are by rifles, and assault rifles constitute an even smaller fraction of that already tiny number. Mass shootings can be achieved just as easily with a pistol as a rifle, and as stated prior are barely a blip in the “gun deaths” number. Gun buybacks cannot work for several reasons. Since gun homicide is almost completely uncorrelated to gun ownership rate, the buyback idea has no efficacy. Even if they would, the United States is so tremendously beyond any other country in gun proliferation that a buyback to get us down to their rates would be laughably expensive, and would still require a bloody search-and-seizure campaign. “Taxing bullets” is a wretched idea because almost all ammunition bought is shot at the range, or in the corn field, by people practicing and becoming familiar with their firearms. It only takes one bullet to kill yourself, which is two thirds of our problem, and it only takes a handful to murder someone. The only people a “bullet tax” would hurt are the subclass of gun owners who are the most responsible with their guns. Making gun manufacturers liable for gun deaths is one of the most ridiculous things I think I have ever heard. It barely deserves mention, because it addresses no problems and proffers no solutions, other than perhaps to take the form of an extremely long, extremely slow gun buyback, while padding the pockets of attorneys. And since there’s basically no relationship between gun ownership and gun homicide, it doesn’t solve anything. Even if it did, the sorts of structural changes that would cascade through tort law because of it boggle the mind. Two thirds of gun deaths are suicides. Seven eighths of gun suicides are men. Multivariate analyses show that female suicides aren’t impacted at all by gun ownership rate, because statistically speaking, women without guns find another method. This is not completely true for men — some men who lack a gun find another method, but some don’t, owing to many factors which probably include population level personality differences. By some estimates, two thirds of people who commit suicide visit a doctor within a month prior to their attempt. Doctors treating depression or suicide should be empowered to discuss firearm ownership and safety with anyone who’s troubled, and should encourage (but not mandate) that the troubled individual entrust their firearms to a friend or loved one while they are being treated. Please note, the plan cannot be to seize guns from anyone depressed or suicidal, because that would disincentivize people who need treatment from seeking it. This part of the plan, and the supporting data to back it, are detailed in the second article. We project it might be able to save around 6,000 people per year. This is very significant, as it could constitute a drop in as much as 20% of all gun deaths alone. This is easy, infringes on no rights, and requires no new laws. It is the fixture of our plan, because it will have more efficacy than any other action we can reasonably take. We know where the homicide problem rests in the USA. The numbers are simply incredible. 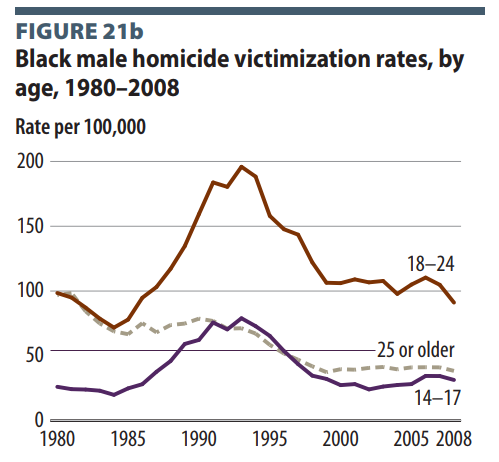 I highlighted the rates by general demographic in a prior article, but if we dig further into the rates among black males by age, as was done in US Department of Justice NCJ 236018, they are even more staggering. The general population in the USA doesn’t see this problem, though, because it’s shunted to the local news, and never makes it into our media echo chamber feeds. We have isolated ourselves from it, because it is no longer sensational, it is routine. The numbers however are stark, and blatant. 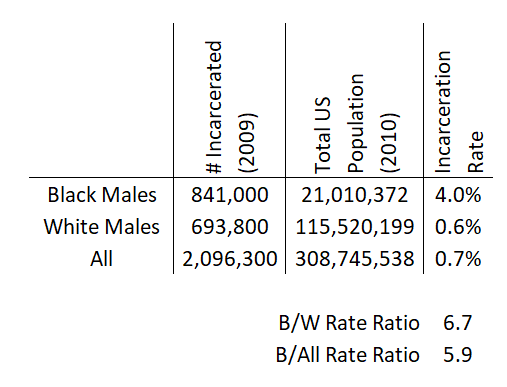 If we take the racial incarceration data from the Bureau of Justice Statistics from 2009, and we superimpose that on the black and white census data from 2010, presuming half of each racial population is male, we can calculate an approximate incarceration rate for males of each demographic. Those rates in the table are not instances per 100,000, they’re percent. Six tenths of a percent of the white male US population is incarcerated, but a full 4% of the black male population is incarcerated. That’s 4,000 per 100,000. Black males are 6.7 times more likely to end up in prison than white males, and 5.9 times more likely than the general population. 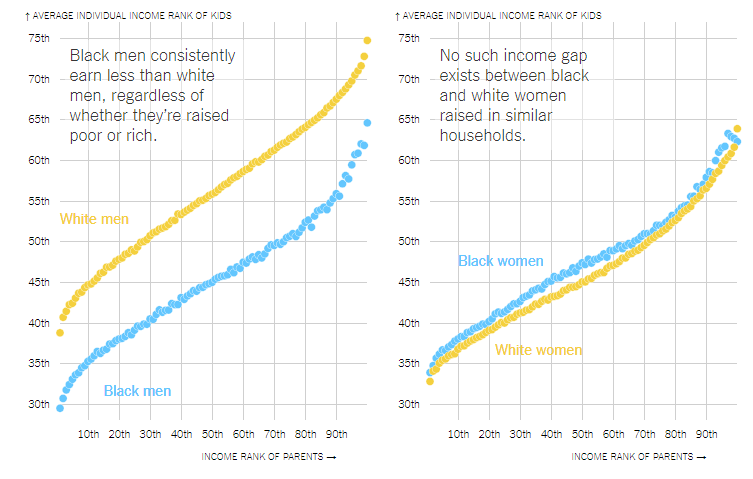 The Pew Research Center tracks a lot of social demographic data, and in 2016 released a series of infographics from their publication “On Views of Race and Inequality, Blacks and Whites are Worlds Apart.” The data show that blacks are far more likely to grow up in single parent households. Given the preponderance of female single parents, it stands to reason that a preponderance of black women have a strong mother figure during their developmental years, but black men are much less likely to have a strong father figure. But even that isn’t the full picture. This recent New York Time article got a lot of play, and has some tremendous visualizations. The headline focused on racism, which may play a part, but I’m less sure that’s the complete picture. I would presume that black women experience levels of racism that are, if not the same, at least similar to black men. But the numbers show that black men have much worse overall outcomes than black women, relative to their parents’ wealth. While kids in most demographics (white men, white women, black women) tend to maintain wealth outcomes relative to their parents, black men do not. The few neighborhoods that met this standard were in areas that showed less discrimination in surveys and tests of racial bias. They mostly had low poverty rates. And, intriguingly, these pockets — including parts of the Maryland suburbs of Washington, and corners of Queens and the Bronx — were the places where many lower-income black children had fathers at home. Poor black boys did well in such places, whether their own fathers were present or not. What they’re saying, and this is born out in the original study as well, is that even black boys with single parents did better overall in neighborhoods with higher rates of fathers at home. A broken black family not only impacts the children in that family, but the children around it. Particularly the boys. I cannot say with mathematical certainty, but it seems tremendously likely to me that all these issues are deeply linked. This link needs further research. The research should take the form, above all else, of talking to young black men. The sample size should be large, and parsed into groups — ones who were exposed to violence and ones who weren’t. The situations of each parsed group should be compared and contrasted, in terms of economic opportunity, family, male role models, cultural exposure to violence, and lead exposure, among other things. I highly suspect the results of that study will show the following. 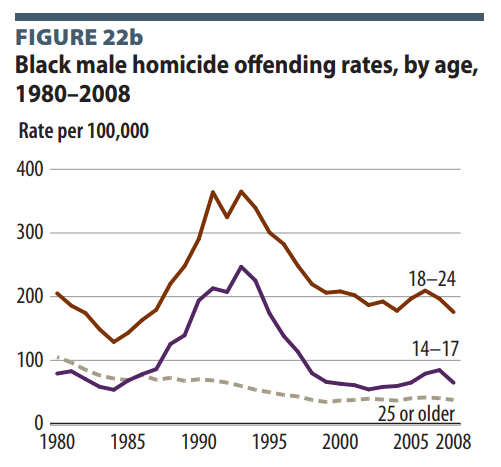 Black men are disproportionally imprisoned for non-violent drug offenses, which breaks up black families. Broken families are under harder economic strain, and are more prone to poor child rearing, both within the family and within the neighborhood. Poorly reared children are more likely to be imprisoned for non-violent drug offenses, and the cycle continues. Since drugs are a black market, no dispute resolution exists in the marketplace other than at the end of a gun, and the whole thing becomes, as Curtis Snow says, “A Trap.” This is not an uncommon topic among urban black culture. There’s even music for it. The Trap is further fueled by the school-to-prison pipeline, privatized prisons incentivized to promote recidivism, and prison and law enforcement lobbyists peddling influence to prevent the legalization of drugs. It costs more to send someone to the federal penitentiary than to Harvard. The solution here is simple. End the drug war. Bring the daddies home. You don’t need new laws, you need fewer laws. Government caused this problem. You also save 76 billion dollars in taxes. Oh buddy. Here things get sticky. You can sell this to the right, but only if you craft it very carefully, and to craft it carefully you must step back from the keyboard and spend the requisite time to truly understand the right’s position. This comic is a great primer. Now, first, I’ll posit some light criticism of the Cake Cartoon. The major omission here is the Firearm Owners Protection Act of 1986, which revised the Gun Control Act of 1968. We might guess that the reason it was left out was because Ronald Reagan signed it, but I of course can’t be sure. That aside, the overall animus of the cartoon encapsulates well the opinions of the Right on the matter, and there will be no gun legislation passed without support from the right, realistically speaking. In order to get to a reasonable compromise, the left must give some cake back. Thankfully, there is absolutely cake that can be given back, which we will get to in a moment. 1) Almost all gun purchases in the country are from Federal Firearms License (FFL) holders, and all those purchases go through online background checks via the NICS system. The NICS is already a de-facto license, except it’s a huge pain in the rear to check. Private sellers can’t check it even if they wanted to, because they don’t have the means. Essentially everyone involved in selling guns, both commercial retailers and private sellers alike, would prefer to simply check a license. 2) Nothing drives a responsible gun owner crazier than an irresponsible gun owner. People who handle guns carelessly, people who don’t follow proper range etiquette, people who don’t follow proper safety rules, and similar, really chap their hides. 3) Guns aren’t cheap, so gun owners have a little disposable income. 4) Gun owners, many of them anyway, are very against any kind of registration or tracking of guns themselves. It’s a thing with them, which I may try to explain in a later article, but for now please just accept that it’s a thing. But they’re not ashamed to own guns, nor flaunt proof that they are responsible gun owners. 5) Gun owners and gun shops alike are very high on training courses. They are not only a good way to familiarize yourself with your firearm, which is an important and responsible thing to do, they also contribute to the sense of community. 1) Get rid of the NICS background check system entirely, as we know it today, but use its infrastructure to manage a database of license holders. 2) Doing anything that would get you flagged on the current NICS system, such as a felony conviction or domestic abuse, simply gets your license suspended or revoked. 3) Licenses are granted to anyone who passes a “Gun Responsibility Course,” which could be taught at any gun range. Marksmanship organizations could also teach the course, including the NRA itself, which not only gives them buy-in to the license plan, but also might steer them back to their traditional role as a training organization instead of a lobbying organization. 4) The curriculum for the course would be simple. It would teach responsible firearm ownership, Jeff Cooper’s Four Rules, firearm safety, range etiquette, and responsible storage away from minors and people with suicidal tendencies. This also buttresses Step One of the plan, regarding suicide, which again is the primary “gun deaths” problem. 5) It’s not a license to own, it’s a license to purchase, so it introduces a simple kind of a “waiting period” for someone’s first firearm, but not for subsequent firearms. 6) Because it’s easy to check, any private seller can simply snap a cell-phone photo of the license of the buyer, and the straw-purchase issue, known on the left as the “gun show loophole,” is officially closed. 7) Because there would be no NICS check for every firearm, there’s no raw “gun tracking” built into it, which appeases the right’s concerns about using a license system as a precursor to nationwide seizures and the like. As mentioned before, this is a thing with them. But that’s not enough cake returned to get universal buy-in to the plan, so let’s return more cake, that I promise you is absolutely safe to return. The inclusion of short-barreled rifles in the Title II firearms list of the National Firearms Act is silly and ridiculous, given there’s no good legal differentiation between a short-barreled rifle and a pistol in the law, and the ATF has gone through some comically tremendous mental contortions just to try and interpret it properly. Further, short-barreled rifles and similar arms are not any deadlier than longer barreled arms of the same type. The rules around them are, quite honestly, a giant joke. Suppressors (“silencers”) are also a ridiculous inclusion on that list, considering their only real function is hearing protection. They do not turn everyone into a movie assassin. If you intend to defend your home from an invader, you very likely aren’t wearing hearing protection. This is a big problem if you’re trying to defend your children, whom you can no longer hear screaming behind the door after discharging your firearm in a hallway because you’re temporarily deafened. Guns are loud. While we’re moving short-barreled rifles and suppressors off the Title II list, move bump-stocks onto it. They will require the application, the additional background check, and the year long wait time to acquire that short-barreled rifles and suppressors currently “enjoy.” That’s taking a little cake back, but moving short-barreled rifles and silencers off the list more than makes up for it. This is what “common sense gun reform” actually looks like. Rights beget responsibilities. As the culture of responsibility is restored, accidents will go down, suicides will go down, gun owners will be happier that new purchasers adopt more responsibility, and we trim the “gun deaths” number the right way. This would work. It has a clear path to efficacy, it’s amiable to all involved, and it would save lives. But I seriously doubt it could get any sort of traction nationally, because it eschews a position in the culture war. And that, in my opinion, is a much wider, and much more dangerous problem. And here we are, wrapping up our gun policy discussion after six articles, with our case built, and our plan presented and defended, and we still haven’t mentioned the Second Amendment once. This is a great series and should be required reading prior to any lawmaker pushing forward a gun law. I think your plan is great. Focusing on mental health and the causes for the economic causes of crime would drive down homicides and suicides. Also, large magazines, rifles, suppressors, and short barreled guns are not the problem. I few comments that I think would make it difficult to get people on board. 1) Universal Background Checks – . I would love a system that anyone could call and check on a person before a sale (free of charge). It allows to ensure a buyer is eligible and there is no paperwork trail. Both sides win (on the surface). However, a UBC is almost unenforceable unless you know what everyone already owns and subsequently buy. This is the slippery slope that the right wants to avoid. Pass UBC and then find it can’t work without registration. Then press for registration. I think it is misleading to make the statement regarding this problem as “it’s a thing with them”. It discounts the reality that everywhere gun registration has happened it has led to confiscation. This has already happened in the USA with certain weapons. Once it is outlawed a letter is sent to you or a LE visit occurs to confiscate the now illegal weapons. The government has less to fear from an armed citizenry if it knows who to target. 2) Paying for a License – No one should have to pay anything to exercise a right. Should a voter have to pay before voting? What about a class to ensure a voter is knowledgeable knows about the issues? Or a license to publish articles? No on all accounts. If a class is required it should be free, short, and widely available. Online would be great. 3) Suppressor/Barrel Length – Yes. This would be great. Both of those laws are dumb and do not prevent crime. Rifle length “pistols” have already effectively bypassed the barrel length rule for many people. If you can buy a gun you can buy a Suppressor (you just need to pay more and wait). However, they are scary to many people and easy for the media to hate. 4) Give back some Cake – The cartoon is a great illustration of the problem. Is gun ownership a Right or is it not? Even if Suppressor/Barrel length laws are changed and CCW reciprocity is passed there will still be citizens with infringed right due to the state they live in. States should not be able to pass more restrictive laws. It is a Right! Imagine if a state restricted any of the other amendments. Freedom of Speech, Unreasonable Searches, Protection of Right, Excessive Bail, etc. Would the answer be to just move to another state? I think not.